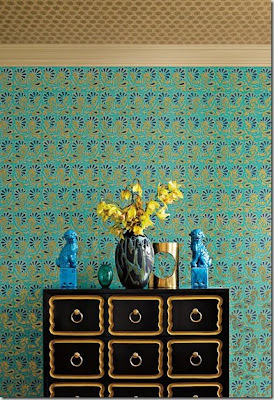 As you can see we've decided on wallpaper #3 - Krysantemer in the gray colorway. Most of you liked #1 & #5 the best. 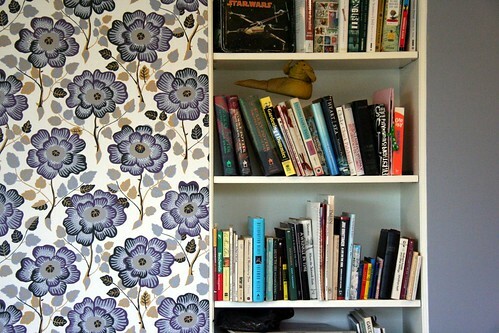 I like these too and I think they are definitely bedroom-y. However, I went with #3 because I loved the color palette - purple, periwinkle/gray, black and gold. The others, while lovely, seemed to easy and I wanted to push myself a bit. I'm just thrilled with the result. The colors are rich, complex and interesting and have a warmth to them that is not noticeable online. Now my head is buzzing with paint color choices. I tried Comet by Benjamin Moore which is the blue you can see on the walls in the pictures. I do like this but it is a bit too blue. A little more gray may be nice. Depending on my energy level I may try one more color or I may leave it with Comet. Comet seems to me to be the definition of a hyacinth blue - it is a rich periwinkle with some definite grape thrown in there. Are you curious about the most expensive wallpaper? Most of you were right on! It was #2 - Rampura. Many of you noticed that it looked hand printed, which it was. Even the wood blocks used for the stamping were hand carved. When I went to order it I learned it was $250.00 a roll!! And I needed 2 rolls! CRAZY! Needless to say that was cost prohibitive. Things do have a way of working out and I'm super satisfied with the one I chose. Thank you for your feedback on my post. It was a lot of fun to read your comments! I've updated my previous wallpaper post with the name and maker of each paper. So...will you select new bedding? Have plans for those shelves? Dana - YES, it was expensive too. However, I justified it because we only needed 1 roll (it was a double) and if I thought of it as a piece of art the price seemed reasonable. 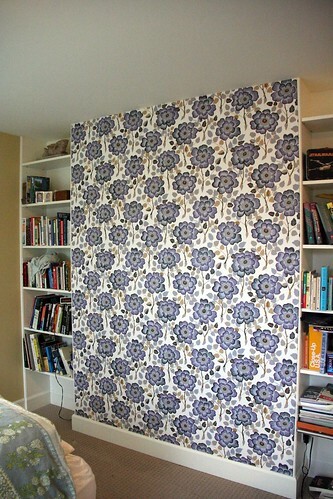 I asked the wallpaper installer about the prices of some of the papers these days, he thinks they can be ridiculously high but didn't really offer an explanation. I think we're paying for the designer not the product, just like jeans or anything else. New bedding, headboard, nightstand and lamps. Chris - Thank you! You can take a look on Thanksgiving.